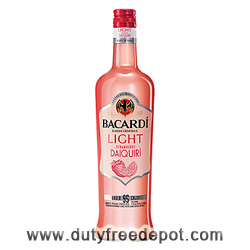 With only 95 calories per serving, Bacardi Light Strawberry Daiquiri is a wonderful summer cocktail, perfect for parties and get-togethers. With a great balanced taste, this cocktail is a perfect drink for those who watch their weight, but still like to indulge in a refreshing alcoholic drink every now and then, guilt free. Best served cold, with ice and mint to inhance the experience.